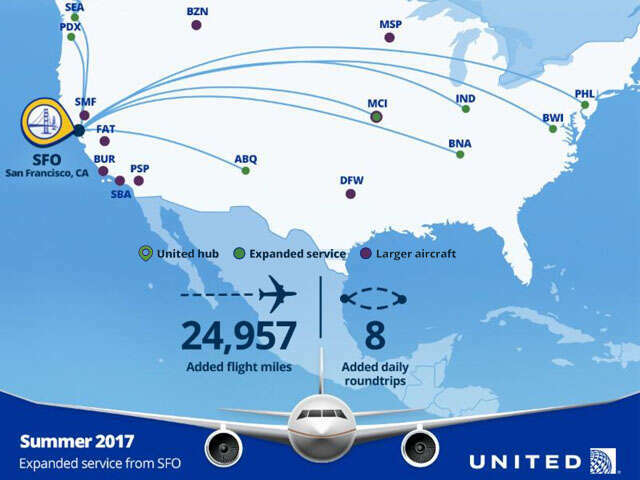 United Airlines (UAL), the leading carrier in the San Francisco Bay Area, today announced it is increasing the number of flights between SFO and eight destinations. Additionally, the airline announced it will convert select regional jet flights to larger mainline aircraft in ten markets. These schedule enhancements build on previously announced new service from SFO to seven U.S. cities beginning June 8. United previously announced service to new destinations starting June 8. The new routes bring nonstop service to more cities, giving customers more convenient travel options to some of the country's largest cities and beyond. There is no change to United's full-year 2017 capacity guidance. United flies nonstop to more destinations in Asia than any other U.S. carrier from San Francisco International Airport, United's gateway to the Asia Pacific. The airline provides U.S. travelers with convenient access to some of the most dynamic cities throughout Asia and gives travelers access via San Francisco for onward convenient connections to destinations throughout the United States, Canada and Latin America.